Once again, I'm changing my regimen just a little. I'm going to start washing my hair in 4 braids again. I have done this the last few weeks and I'm not sure why I ever stopped. This technique causes far less breakage, and adds just 10 extra minutes to my current regimen. I still put my conditioner mix on dry hair, then lightly detangle with my hands. 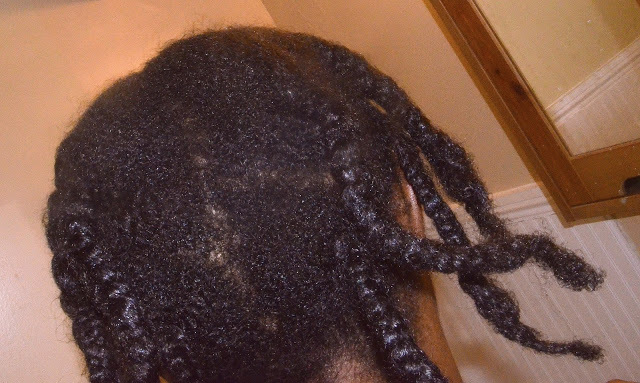 Then braid my hair in four parts...let the conditioner sit for an extended period of time ( 24 - 48 hours). Shampoo while my hair is still in braids.. next, undo each braid in the shower as I rinse the shampoo/preconditioner treatment out. 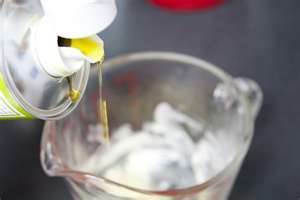 In findings published in the March/April 2003 issue of the "Journal of Cosmetic Science," coconut oil is one of the few oils that actually penetrates the hair shaft. The research also stated that it's best to put this oil on dry hair before you shampoo for an extended period of time to get the full shaft penetration. It can also be used as a post wash treatment. It is a natural conditioner for the hair which prevents protein loss greatly. Avocado oil is high in vitamins A, B, and C, as well as protein, copper, magnesium, iron, folic acid and amino acids. All of which are vital for proper hair nourishment and growth. This is one of the big dogs in hair oils...just make sure you purchase raw deep green avocado oil to get the full benefits. AKA "sweet almond oil" is super rich in quality protein, vitamin E and magnesium...which are essential for healthy hair growth. It also adds shine & softness to the hair shaft. After I added this oil to my hair, the next day my hair appeared shiny and stronger. The oil has a long shelf life. Be advised if you are allergic to nuts, almond oil may also produce an allergic reaction when it comes in contact with your skin and scalp. This sweet goodness is high in vitamins and minerals. Honey is a humectant (attracts, hold & retain moisture ) and a emollient ( inhibits the loss of moisture), serving as a good moisturizer and conditioner. This oil has a strong minty smell and is known to stimulate hair follicles which in turn promotes hair growth. Research shows that it is an effective remedy for hair loss as it binds the hair roots and improves scalp stimulation by increasing blood circulation. Surprisingly, this oil works as an effective conditioner and adds shine and gloss to your hair. Only use this essential oil with a carrier oil to prevent irritation. If you have high blood pressure ...be sure to check with your doctor before using this essential oil. Also make sure your hands are completely clean from this oil before you touch your eyes...this stuff burns like cayenne...LOL! I don't add conditioner to my mix anymore as it's not needed. I use equal parts for all the oils & honey except the peppermint oil. You only need 8-10 drops to get the full benefits from it. As I stated in an earlier post, I use the MISTO to mist my hair with oils. This saves money, because you are only misting the oils into the hair shaft... not wasting it by applying it with your hands. I used to have a ton of oil still left on my hand that I did not need. I like to feed my hair like I feed my face...with the best natural high vitamin fill oils that I can find. I've found that it's always more beneficial for my hair and body. Remember our skin absorbs every thing we put on it, so try to stay way from synthetic chemical laden products whenever possible. So what new oils have you discovered? What were the benefits? Do you comb out the hair the next morning? What style do you do after this process? usually twists, bantu knots or big braids. Okay I see your regiment. Where do you buy your own oil?